Making customer-level decisions that balance risk and profit just keeps getting harder. And when you think you have it right, turning them into actions can be even trickier. You also need to consider the factors that make smart decisions difficult. Big data. Regulations. Customers who want an offer, fast, or else you’re going to lose them. No doubt some of these challenges sound familiar. 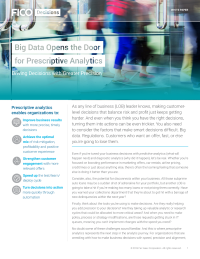 And this is where prescriptive analytics represents the next step in the analytic journey. For organizations that are wrestling with how to make business decisions with speed, precision and alignment, prescriptive analytics can ultimately uncover new ways to drive profit and customer-centricity, and continue to provide new insights that can amplify the results, even after the initial blast of ROI.